The Port of Duluth-Superior generated $1.4 billion in economic activity and supported 7,881 jobs last year. Handling 35 million short tons of cargo generated over $504 million in total wages, salaries and purchases of goods and services in the regional economy. Cargo movement and vessel activity at the port also generated a total of nearly $240 million in federal/state tax revenues. 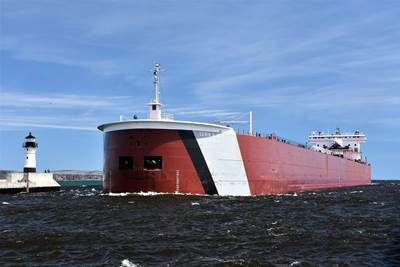 The full report for the Port of Duluth-Superior, released by the Duluth Seaway Port Authority, spotlights local port activity gleaned from a much broader study released last month about the economic impacts of the entire Great Lakes St. Lawrence Seaway (GLSLS) system conducted by Martin Associates. Some 35 million tons of iron ore, coal, limestone, salt, cement, grain, steel, wind turbines, and heavy machinery move through the Port each year, helping to keep businesses running in adjoining states and in communities along the U.S.-Canadian border. Farmers, miners, steel producers, construction companies, food manufacturers, utility companies and street maintenance departments depend on this System to move raw materials and finished products to market. Employment figures reported in this local study reflect direct jobs generated by moving marine cargo such as longshoremen, terminal employees, crane operators, steamship agents, vessel operators and crews, freight forwarders and stevedores plus railroad workers and truckers. Induced jobs are created when individuals spend their wages locally in grocery stores, restaurants, shopping centers and on home purchases. The study also captured indirect jobs created when marine-related businesses purchase goods and services from office supply companies, maintenance and repair contractors, equipment suppliers and the like. The nearly 20 privately owned bulk cargo docks in the Port of Duluth-Superior, plus one general cargo terminal operated by Duluth Cargo Connect, altogether account for the 35 million short tons of cargo moved during the 2017 navigation season.